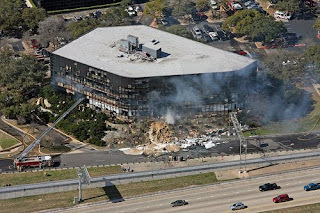 A small aircraft crashed into an office building in Austin, Texas. The crash was apparently a deliberate act. 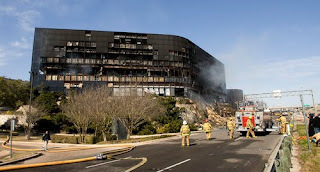 The building contained offices of the US Internal Revenue Service (IRS), and the pilot involved in the crash had a long and contentious relationship with the IRS. The pilot, Joseph Stack, had set fire to his house earlier, and had left a detailed letter on his web site that implied violent threats against the US government. Stack's house caught fire at about 9:15 a.m. According to the FAA, the plane, a single-engine Piper Cherokee PA-28-236 Dakota (N2889D), took off from the Georgetown, TX municipal airport at 9:40 a.m. 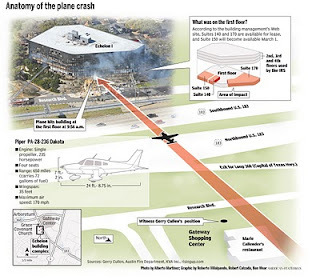 The crash site was about 20 miles (32km) SSE of the airport and the crash happened at about 10 a.m. The pilot and one person in the building were killed in the crash. 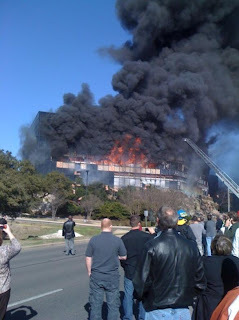 At least one person in the building was seriously injured and airlifted to a burn center in San Antonio. About a dozen other building occupants were injured. 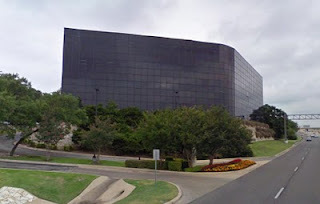 Austin police chief Art Acevedo stated that the crash “appears to be an intentional act, appears to be by a sole individual, and it appears this individual was targeting federal offices inside that building.” Numerous witness accounts were also consistent with a deliberate flight into the building. After the attacks of 9/11, the US government added multiple security measures affecting commercial airliners and private aircraft. While private aircraft face significant restrictions in the airspace around some areas, most notably the Washington, DC area, most areas have had no significant changes in procedures. The airport used by Joseph Stack is a general aviation airport, and like most such airports there is no permanent security provided by TSA or any other federal agency. When the control tower is closed and the gates of the airport are closed, there is a system in place to allow anyone to gain access to the airport simply by driving through an automated gate. Security is mostly in the hands of airport users, who are encouraged to report unusual security situations. 12 September 1994 - After spending an evening with his brother consuming alcohol and smoking crack cocaine, Frank Eugene Corder, who was not a licensed pilot, stole a Cessna 150 and crashed into the South Lawn of the White House complex, with some parts of the airplane hitting the White House residence and causing minimal damage. Corder was killed, and no one else was injured. 5 January 2002 - A 15-year-old boy, who was not a pilot, stole a Cessna 172 and flew it into an office building in Tampa, FL. The pilot was killed and no one else was injured. 18 April 2002 - A Rockwell Commander 112 aircraft crashed into the Pirelli Tower in Milan Italy, killing the pilot and two others in the aircraft. A suicide was suspected, but not conclusively proven. 11 October 2006 - An aircraft carrying New York Yankees pitcher Cory Lidle and his flight instructor crashed into a 50-story building located in the upper east side of Manhattan. One person on the ground sustained serious injuries, two people on the ground sustained minor injuries, and the airplane was destroyed by impact forces and post crash fire.